From Everest to Rolwaling trek is a new circuit, over 3 high passes and amongst breath-taking high mountain scenery, through the Khumbu - Sherpa country up to the wild and little-frequented region of Rolwaling. After a magnificent mountain flight to Lukla we start our trek through the Khumbu, Sherpa country. We ascent the Kala Patthar (5545 m) to savor the incredible scenery, including magnificent views of Everest, Ama Dablam (6856m), Kantega (6809m), Kwangde (6194m), Nuptse (7879m), and Lhotse (8511m), to name but a few. We join the Gokyo lakes via the Cho La Pass (5420 m). After the ascent of Gokyo Peak (5480 m) the path continues over Renjo Pass (5345 m) and descends into the Bhote Khosi valley. We enter now into the Rolwaling and come closer to the Tibetan boarder. One of the highlights of this trek is the Tashi Lapsa (5755 m), the gate to Rolwaling, hidden in the glaciated wilderness of the very heart of the Himalayas. The mountain scenery is stunning: Tengi Ragi Tau (6943 m), Bisphero Go Shar (6729 m), Dragkar Go (6793 m) and countless snowy peaks. Level of difficulty * * * +, Maximum altitude: 6272 m, Best season: Spring and autumn. then trek to Phakding (2600 m) in 3h . Great sight of the Kusum Kangru (6369 m). Sherpa capital of the region, in 6 h. Climb up on the right bank of the Dudh Koshi, surrounded by summits rising above 6000 m.
Day 05: Namche Bazaar - Khumjung. 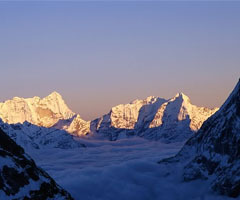 From the pass above Namche Bazaar we enjoy our first great views of the Everest, Lhoste, Nuptse and Ama Dablam. in 4h. Steep descent towards a bridge over the Dudh Koshi, and then climb up a zigzagging path through rhododendrons bushes. Some superb mountain sceneries towards Tengpoche, famous for its legendary monastery, the largest in Khumbu. in 5 h. A steep descent through woods towards a suspension bridge over the Imja Khola River, then a steady climb up to Pheriche via Pangboche that houses the most ancient monastery in the region. in 5 h. We continue up the wide valley beneath the impressive peaks of Cholatse (6440 m) and Tawoche (6542 m). The climb gets steeper to reach the foot of the Khumbu glacier, and then zigzag up through the boulders of the glacier terminal moraine. Superb views of Nuptse. Day 10: Gorak Shep - Lobuche - camp after Dzongla (4950 m). We descent through moraines towards Lobuche then progressively climb up to Dzongla. Gokyo (4750 m) in 7 h. After the pass, we shortly cross an easy segment of the glacier then descent a steep trail through blocks of rocks. in 5 h. A breathtaking 360 º view with Lhotse, Everest, Makalu, Cho Oyu, four of the forteen 8000 m on earth, dominating the myriad lesser peaks. Rermo Pokhari (5000 m) in 5.30 h. Magnificent panorama from the pass : Tengi Ragi Tau, Rolwaling Himal and the small Rermo Pokhari lake on west and Gyachung Kang, Everest, Lhotse, Makalu and the Gokyo lakes on east. in 5 h. An easy and pleasant descent. At the tiny Sherpa village of Thame, we can visit a picturesque monastery perched at hillside. in 5 h. We enter now the Parchamo valley that offers wild scenery. in 6 h. We carry on our steady progression through moraines and gentle slopes. We establish our campsite about 500 m bellow the Tashi Lapsa pass, just underneath an impressive rocky section coming down from the Tengi Ragi Tau. Tengpo (4500 m) in 8 h. A tough climb takes us to a steep slope (ice or rocks, depending of the weather conditions) about 35° and 100 m high. From the top we will join an over-hanging trail taking us to a snowy section. We will climb snowy slopes to reach the Tashi Lapsa pass. From the Pass we get a unique view towards Tengi Ragi Tau (6943 m), Bigphero-Go Shar (6729 m), Dragkar-Go (6793 m), with a background of myriad peaks towards the Tibetan boarder. We then retrace our steps to the camp and descent to the Tengpo. Day 18: Tengpo - Thame (3800 m) in 3 h. An easy descent. in 3-4 h. This is a short and relaxing day. Many of the typical mani walls and prayer wheels are spread on the trail to Namche, the Sherpa capital. We have plenty of time to explore the bustling local market and admire the beautiful vistas of Thamserku (6608 m), Everest (8848 m) and Lhotse (8511 m). Day 20: Namche Bazaar - Lukla (2800 m). We descend through the forest and continue along the Dudh Koshi banks. A short climb takes us to Lukla. Day 21: Lukla - Kathmandu by plane. Day 22: Kathmandu. Day at leisure. Safety day for your international flight. Day 23: Kathmandu. Hotel - airport transfer.